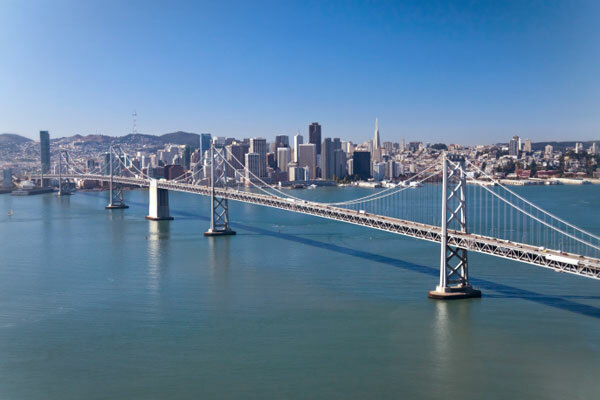 Our San Francisco rental cottage is located on Russian Hill, convenient to and from San Francisco International Airport, the Bay Bridge & local attractions. Take 101 North to 80. Take the 7th Street Exit, where it crosses Market, bear to the right and it will become Leavenworth. Stay on Leavenworth to Vallejo. Turn left and go to 1255. Take the first exit which is Fremont. When it crosses Market, get in the left lane, go left at Pine (1st left). *Daily maid service not provided. Guests are asked to tidy up after themselves. The small kitchenette consisting of a microwave, refrigerator and sink is suitable for making a light breakfast. NO COOKING please. Final payment must be made in cash, cashier’s check or travelers checks. We do not accept credit cards. Please, no personal checks except for payment of deposit. A deposit equal to one night of your stay is required to confirm a reservation at our San Francisco rental cottage. We allow 7 days for the arrival of the deposit. Payment of deposit constitutes your understanding of our policies and, most importantly, your agreement to abide by them. 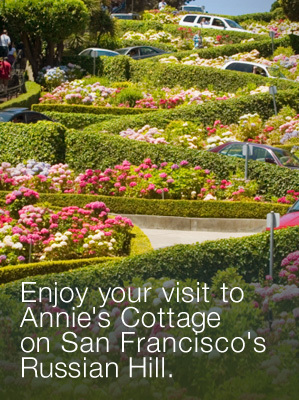 Annie's Cottage is close to local attractions in San Francisco. You can take the cable car just steps from your front door to nearly anywhere. Relax on the private porch. We have one guest room located on the lower level of the 1907 cottage on San Francisco's Russian Hill. A full private bathroom, small kitchenette and outdoor patio are a few of the amenities.